I’m thrilled to let you know I’ve been appointed as the Patron of Reading for North Durham Academy in Stanley, County Durham. A Patron of Reading (PoR) is a school’s special, designated children’s author with whom the school forms a personal attachment. The patron might be a writer of fiction, a writer of non-fiction, a poet, storyteller or an illustrator. Tenure lasts for a minimum of a year, but the exact length is decided mutually between the school and patron. I was a Patron of Reading last year for the District CE Primary School in Warrington. The team there came up with some really clever ways of supporting reading, so the bar has been set high for my work with North Durham Academy. This time I’m working with older pupils, from Year 7 to Year 10, and even with some of their Sixth Form English students, so it’s going to be fun to come up with new ways of encouraging their love of books. The good news is that they have an excellent library at NDA, and the staff are eager to support the initiative. The first task is to put a battle plan together before I spend my first day there in the near future. Can’t wait to get started. I’m thrilled to be featured on the Guardian’s website today talking to Charlotte and Eva from the Millennium Riot reading group about being a writer, the power of reading, and casting Benedict Cumberbatch as a bad guy. Read the full article here. “Something followed me out of my dream. No, not some thing. Some one. Someone followed me out of my dream. He’s watching me now from the end of the bed. I’ve just finished a short story for the National Literacy Trust for their Premier League Reading Stars programme. Scissors is a creepy story about a boy who finds he’s not alone after a vivid dream. The story is told in ten chapters, each of which is meant to be read out loud to a class of children (9-12 years old) and leave them wanting more! Each part can be read in under five minutes and can be used to stimulate discussion and creative writing. You can download and read it here. If you use it in your class please do let me know how it went down. Premier League Reading Stars is a partnership between the National Literacy Trust and the Premier League. It is a reading intervention programme that captures the motivational power of football to inspire young people to read more and to improve their literacy skills. It delivers statutory requirements of the new national curriculum. Over the past three years, thousands of children have used Premier League Reading Stars to raise their attainment. In 2014, 3 out of 4 children made at least 6 months’ progress in reading in just 10 weeks; 1 child in 3 made a year’s progress, or more. Isn’t this the best thing ever? 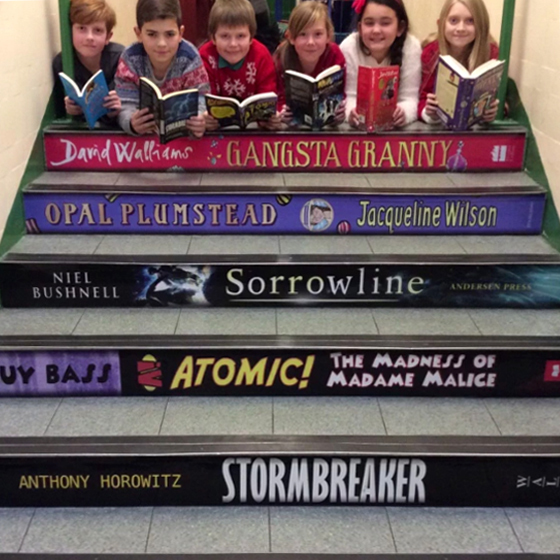 This is one of the many ideas of the genius staff at The District of CE Primary school in Newton-le-Willows where I’m Patron of Reading. They’ve jazzed up a small flight of steps with the spines of some of their favourite books, and I’m delighted to be included in amongst so many amazing writers. I think it’s such a clever idea, a simple reminder to the pupils as they move around the school about the importance of reading. I can’t wait to see it for myself when I visit there again in the new year! 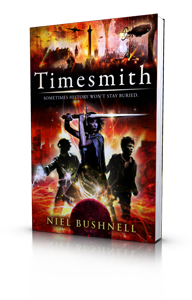 Timesmith Publication Day! World Book Day! It’s here at last! My second book is officially published today and it feel so much different to when my first book, Sorrowline, came out. Last year we marked the day with a trip to York and champagne in First Class – I even bought myself a ukulele! That was January last year. 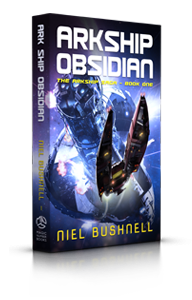 This time round publication has landed on World Book Day and it’s a busy week! I’ve been doing lots of visits to libraries and schools this week and today I’m travelling to Leeds to The Morley Academy! I’m really looking forward to it, I can’t think of a better way to celebrate the launch of Timesmith and celebrate World Book Day all in one go! If, like me, you live in the North East of England you might want to come along to my book signing event in Waterstones Middlesbrough. It’s happening on Saturday 15th March between 11 and 2. It’d be great to see you there! 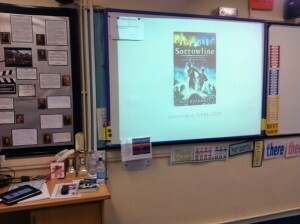 Last week I went back to my old school to talk to some of their Year 7 pupils about writing Sorrowline and my career in animation. I’ll admit I was pretty nervous as I pulled into the car park and went into the reception, dodging groups of lunch-time pupils looking at me suspiciously. It’s changed a lot since I was there – all for the better – but memories of grim school days still prevail! But my fears were unfounded! The pupils were a delight, about 35 Gifted & Talented who listened intently, and asked lots of questions! I can home buzzing, feeling like a rock star! But then I had to do it all over again today for World Book Day. This time it was a different school, and it was the entire Year 6 pupils – about 65 in all! So the butterfiles came back and I started thinking it would be a disaster! I’m relieved and happy to report that the afternoon was a barnstormer – in spite of a jokey comparison to the bald,glasses-wearing funster Harry Hill! If anything I had even MORE questions than last week, and lots of enthused faces. Given that they had to sit on the floor for two hours I was impressed with their attention and politeness. I came home bouncing like Tigger! It’s great to meet so many enthusiastic young people who just get where you’re coming from, and are really engaged in what you’re telling them.